Yeah, we’re finally here! I’m going to show you how to make soap today, how exciting! Well, lets get to it – and don’t miss the detailed photos of each step of the process toward the end of this post. 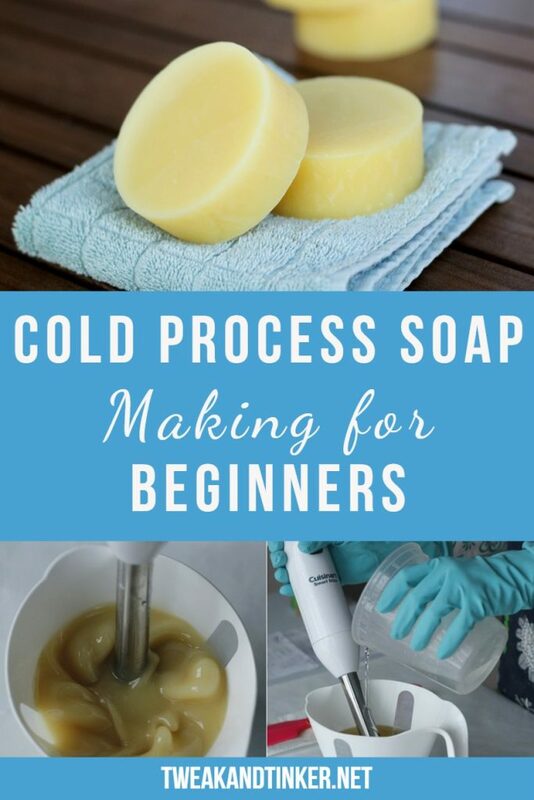 If this is the first time you’re making cold process soap I suggest you read up on lye safety here and make sure you check out the full list of equipment and materials you’ll need here. 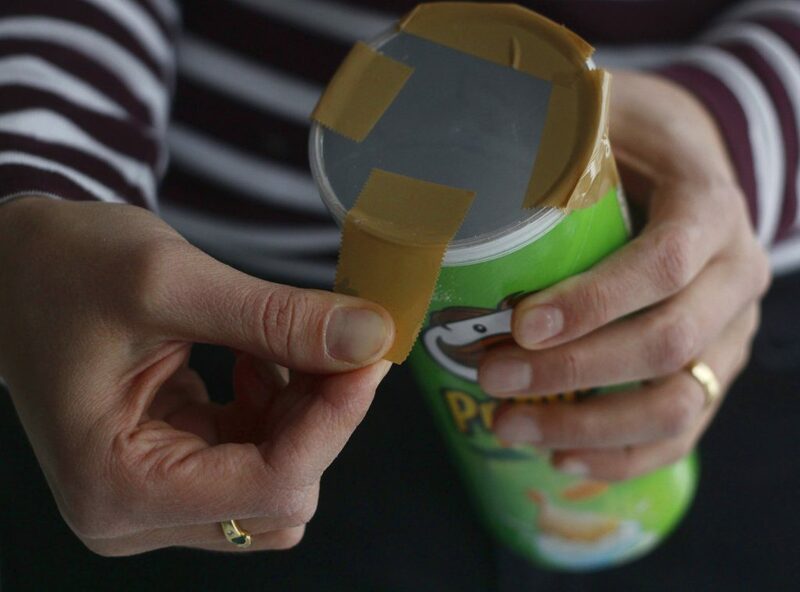 A great part of this process for beginners is that you don’t even have to spend money on a mold- we will be using an empty Pringles can. When it comes to soap recipes the possibilities are endless depending on the oils/fats you want to use and how much of each one. My goal for this tutorial was to choose as few different oils as possible and they had to be on the cheap side as well. I also didn’t want to use animal fats or palm oil. 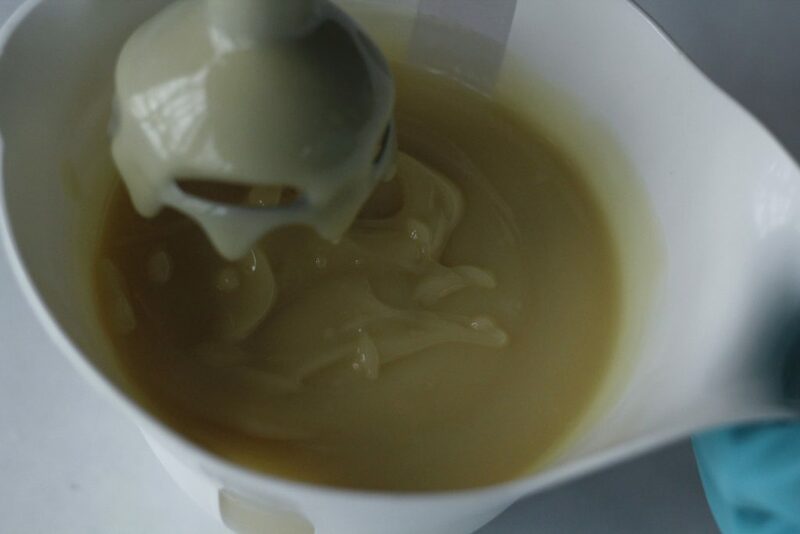 The result is a simple recipe that packs a pretty punch when it comes to skin loving properties. I chose Lemongrass EO for this beginner’s tutorial because it’s very forgiving. 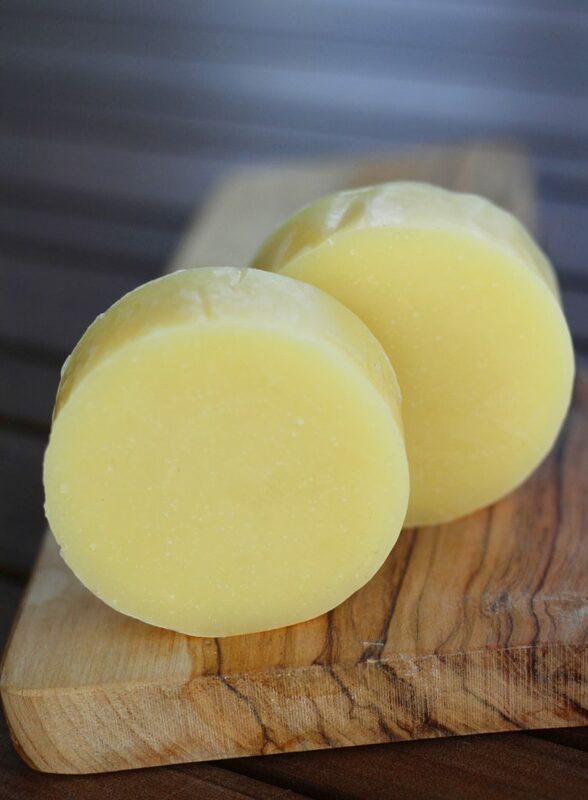 You can’t go wrong with lemongrass: the scent stays strong (which can be an issue with other EOs), it’s easy to work with, it has a bright, fresh, citrusy scent, and as a bonus it gives your soap this nice yellow, buttery color. Slowly while constantly stirring pour the lye into the water. Never, never the other way around! 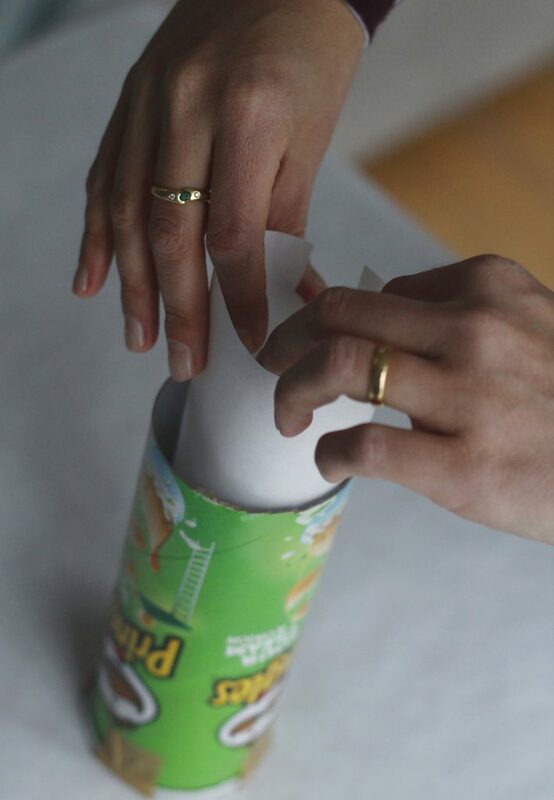 There will be fumes while you’re doing this. As much as possible hold your breath, if you have to inhale turn your head to the side. 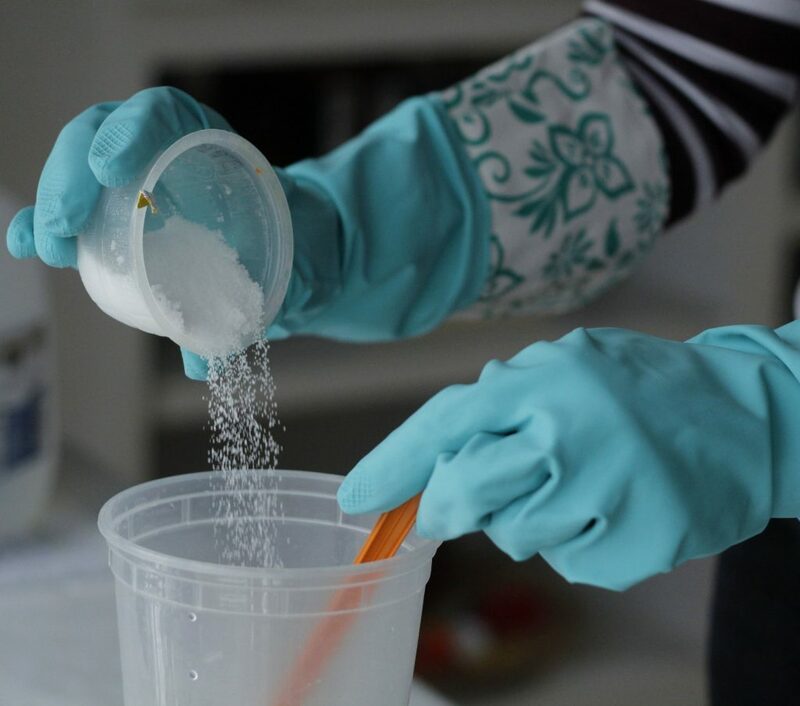 Work swiftly and set your lye to the side when it is completely dissolved. In a small saucepan or microwave proof container measure out the coconut oil and shea butter. 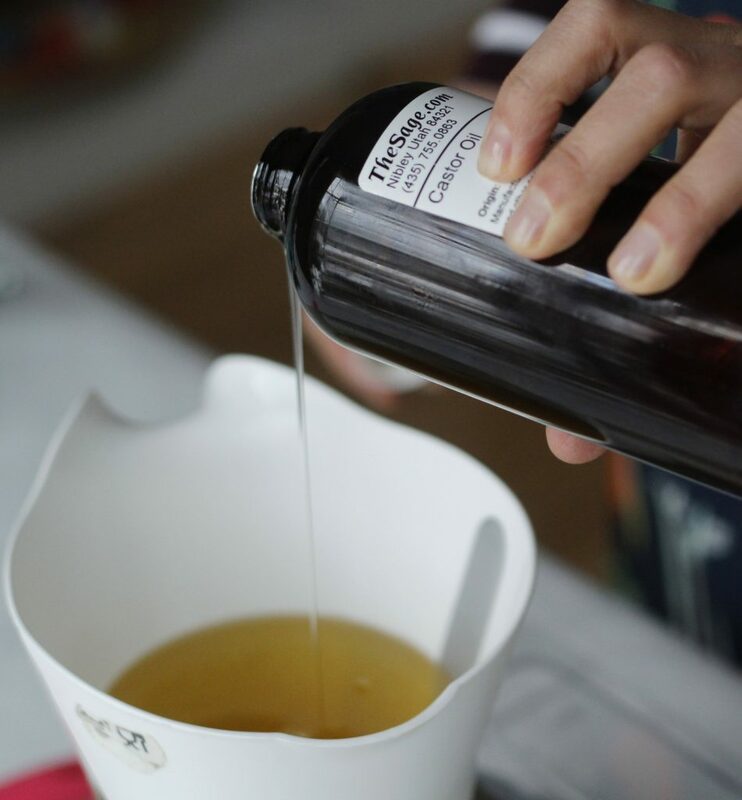 Sometimes the coconut oil needs to be heated a little in order to get it out of the container. Now comes the juggling part. 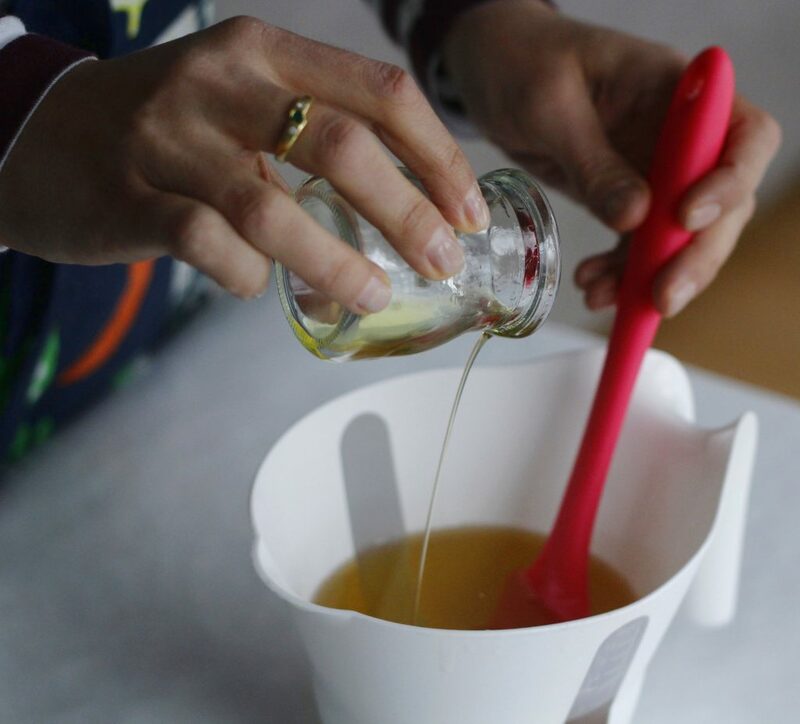 You want to have your oils and lye solution both at about 110 Degrees Fahrenheit and ideally not more than 10 degrees from each other when you pour. This means that you might have to heat your oils slightly after a while. 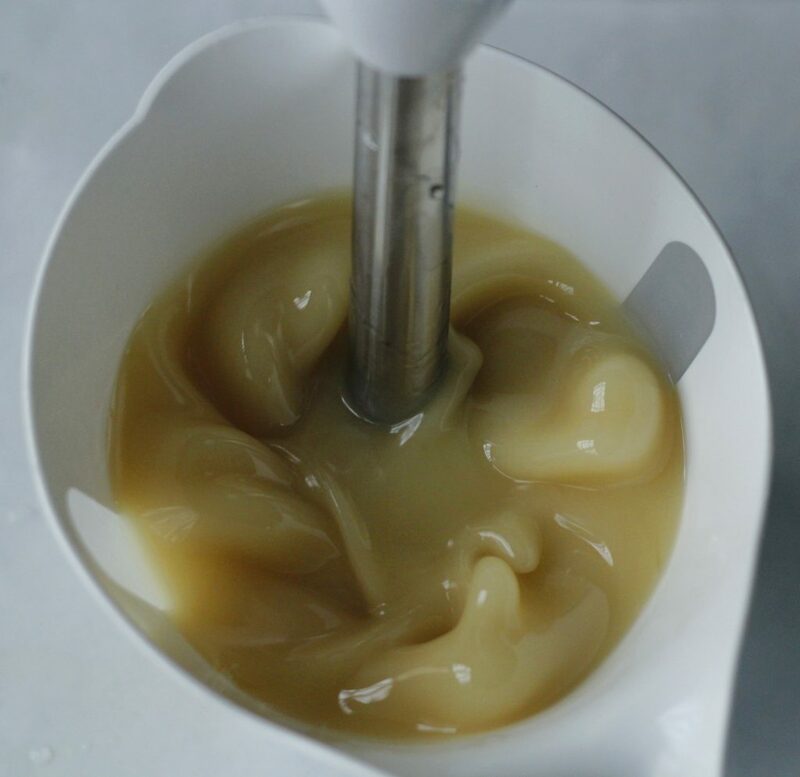 Slowly pour the lye solution down the shaft of your stick blender. 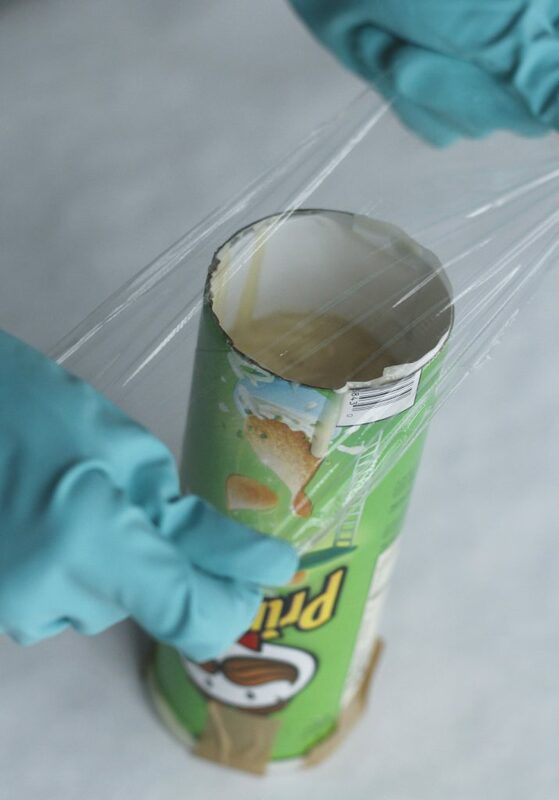 This will reduce any air bubbles being trapped in your soap. 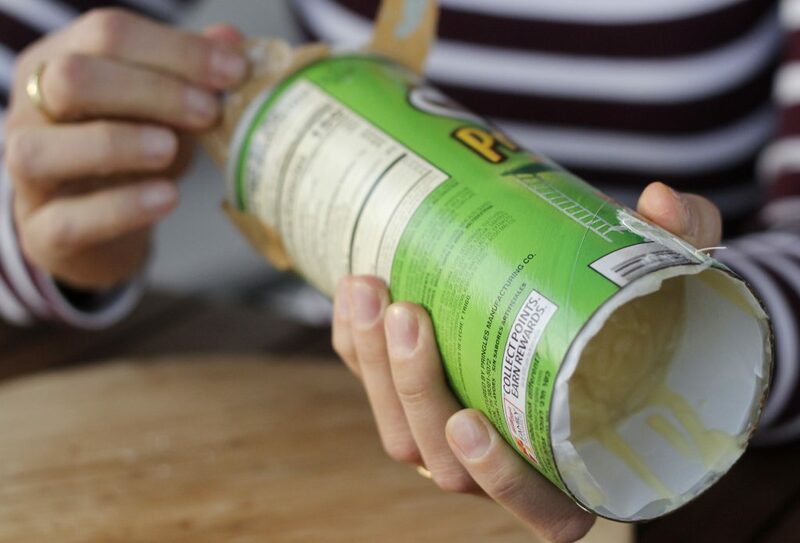 Gently tap your stick blender to further release any air. 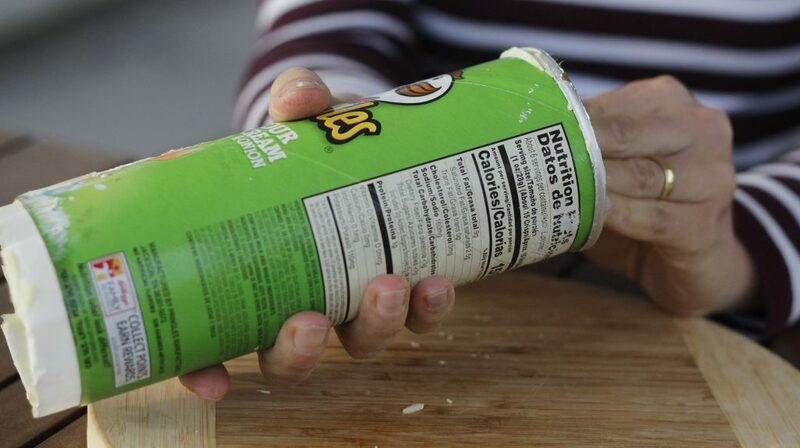 Carefully turn on your stick blender, blend your 20 seconds and check consistency of your batter. We’re aiming for a pudding consistency (see picture below). Lay your soap on a flat surface. 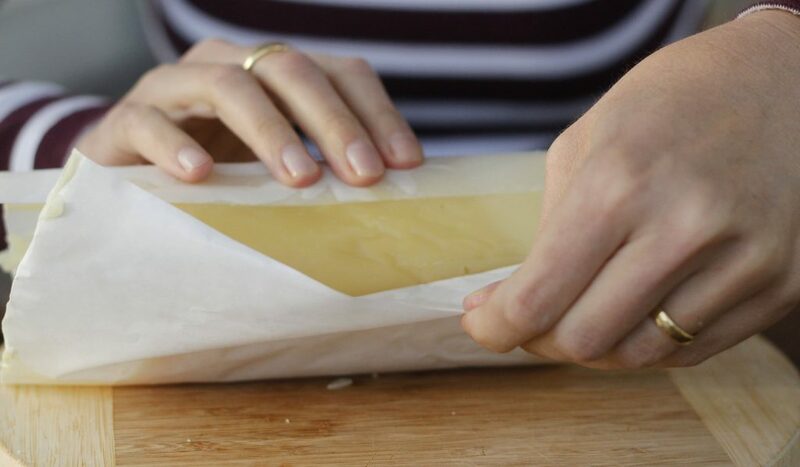 Holding a knife with both hands, shifting your weight evenly perpendicular to your soap, push down as straight and evenly as possible. Tada! Your first bar of soap! Let your bars sit for 4 weeks before using or gifting. Choose a place that’s away from direct sunlight and humidity. Make sure air can get to your soaps evenly, a wire rack works best I find. 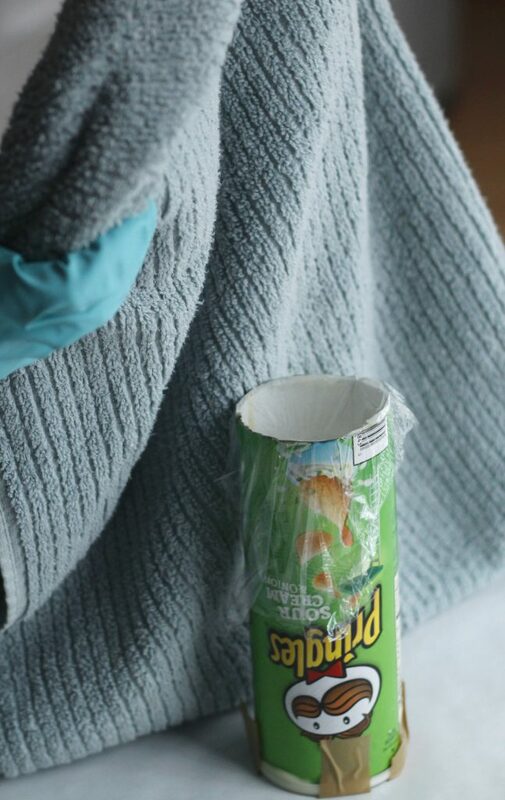 Firmly taping lid to the can to avoid soap batter seeping out. Oils are starting to emulsify- can you see the them turning white and creamy at the bottom? Hi Celine I am a new be myself, Still waiting on all my supplies to arrive thats how new I am I will be trying this recipe first, finger crossed it turns out.I am exited and overwhelmed at the sometime if that makes since. I look forward to following you. Thank you for post. I am just beginning the adventure of making my own soaps and many other personal care products. My main concern is that I am extremely allergic to coconut oil(: What can I use in substitute of the coconut oil? hello. 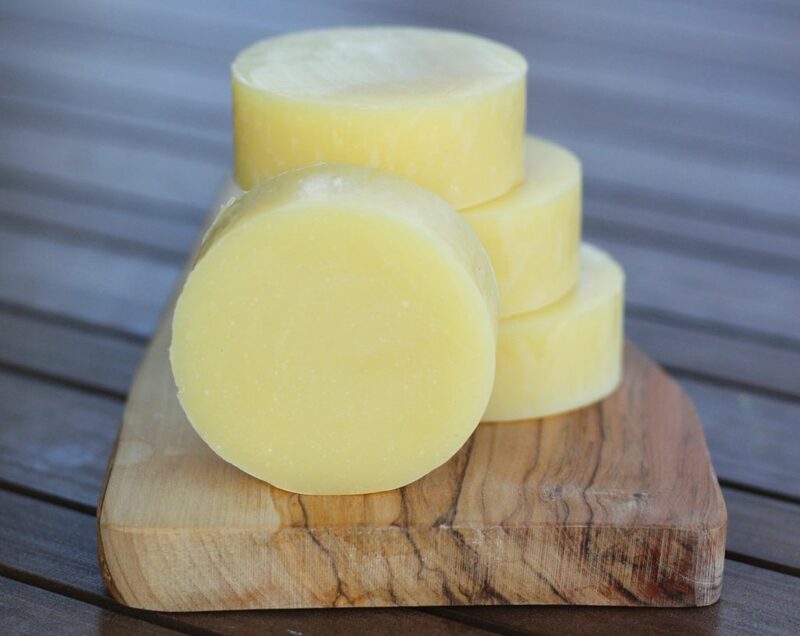 I made a batch of 100% coconut oil soap yesterday using lye and distilled water. I poured the soap into the mould as soon as it traced. The issue is I forgot to cover the mould immediately and when i realised 40-50 mins later, the oil had oozed out on top in the mould. Just then, I salvaged the soap by spraying and pressing the oozed part with rubbing alcohol and bubble paper respectively. Then, I covered the mould with cloth and unmoulded it 24 hours later. While cutting the soap, some oil oozed out again. My query is would the soap cure well and how long would it take to lather? Also, is the soap salvaged? Is 24 hours enough time to wait to cut the soap. thanks. 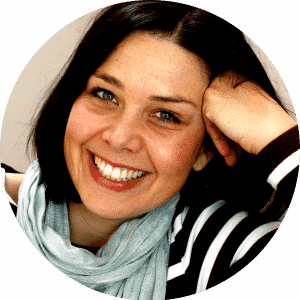 Hi Monica, can you tell if it’s your base oils or your fragrance oil oozing out? 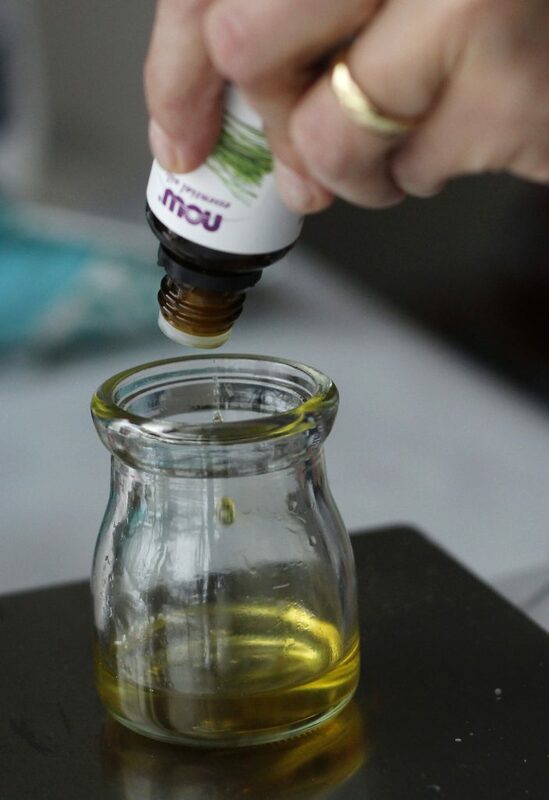 If it’s the fragrance oil you could wipe it of and your soap should be fine after the cure. 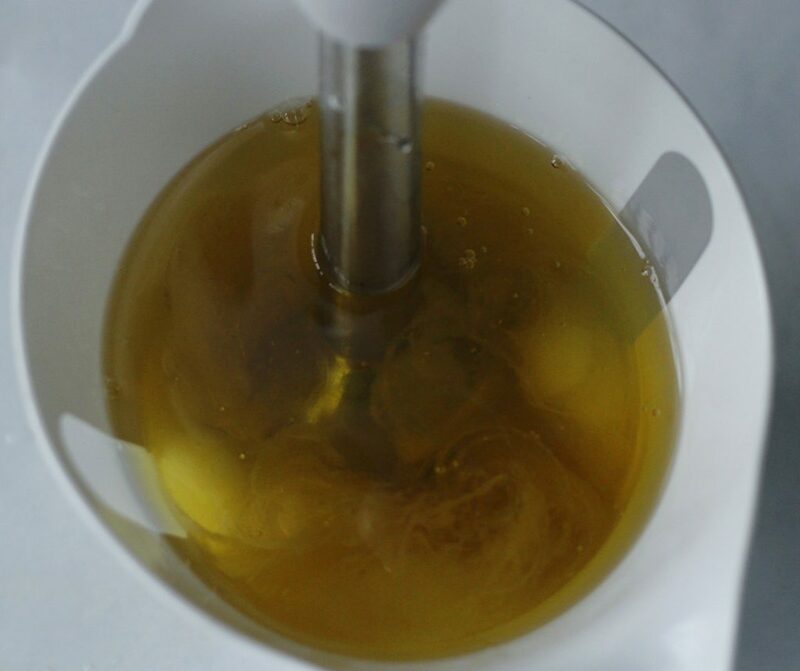 If it’s your base oils, you would have to check if your soap is lye heavy or not (look for pockets of undissolved lye). What super fat did you use? I know there’s a coconut oil recipe that uses 20% SF I’ve never tried to make it though. Maybe then there’s too much free oil in the soap that it oozes out? I would have waited for the saponification process to be done after 36 hours to cut the soap, since you saw there might be a problem. It’s really hard to tell from afar. 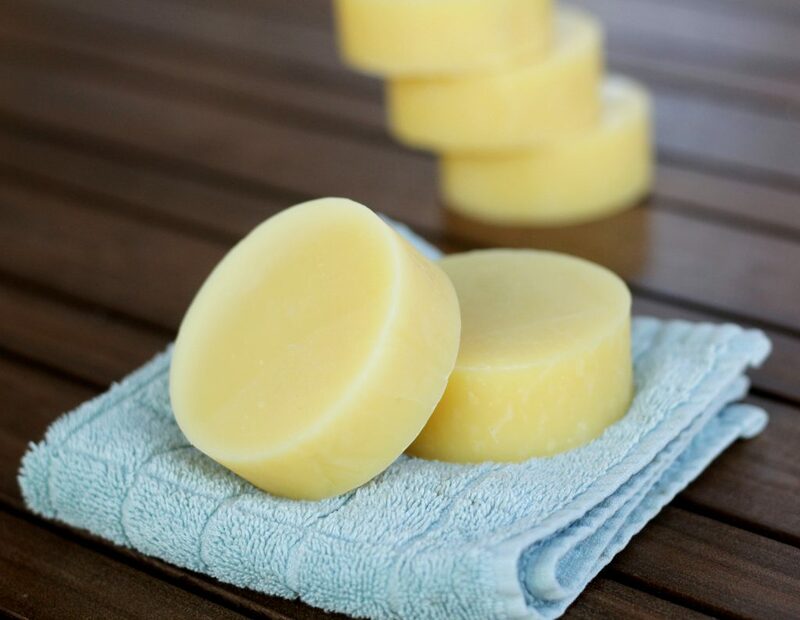 But make sure your soap isn’t lye heavy, give it some time to dry and then do a lather test. It might just be fine. I am new to slap making and am trying in small batches. However my soaps never achieve the firmness that is required. Often they break on use or lose shape. Many times the oil remains on top and the soap becomes to lose. What could be the reason. The trace fory last soap was little liquidy than one in image. Could that be the reason or the measurements. I use olive oil, coconut oil, palm oil 3portion, castor oil 1 portion and water was 38gms per 100gm of oil and lye 14gm per 100gm oil. I just ran your recipe through a lye calculator. I get 14g of lye a well per 100g of oils as well. Try reducing your water content to 29g per 100g of oils. 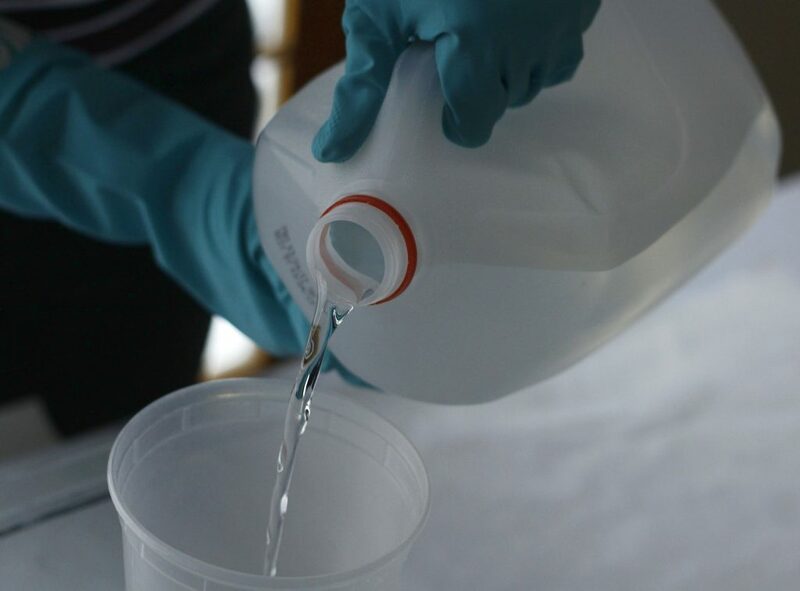 This will give you a 33% lye solution and will help the soap reach trace faster. Assuming that your measurements are correct, try stick blending longer. Especially if you’re a new soapmaker, you want to make sure the batter has emulsified and doesn’t separate later (oil remaining on top). 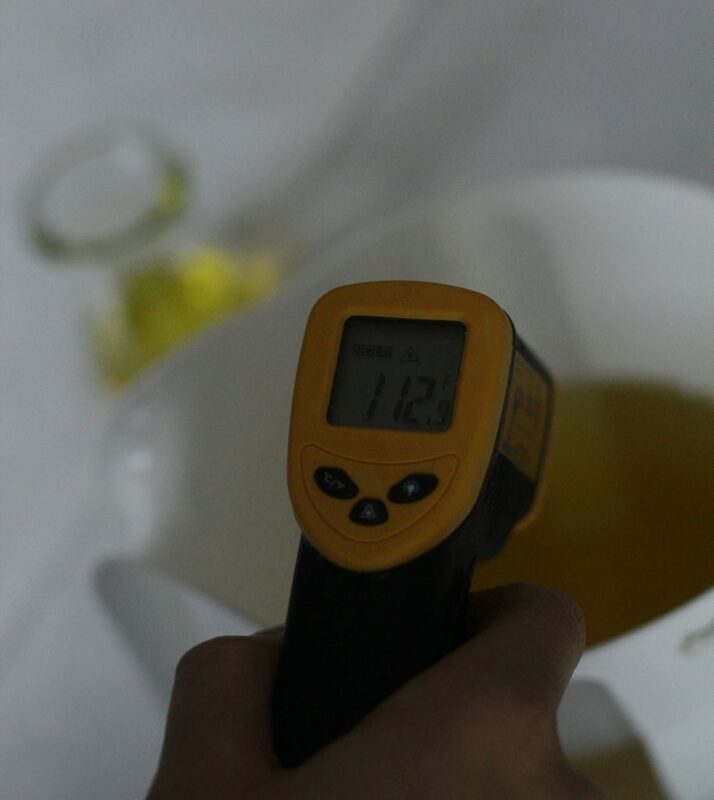 What temperatures are your oils and lye when you mix them? I am very new at soap making and I have not purchased any products except coloring and essential oils. Where is the best place to purchase my equipment, utensils, and ingredients? 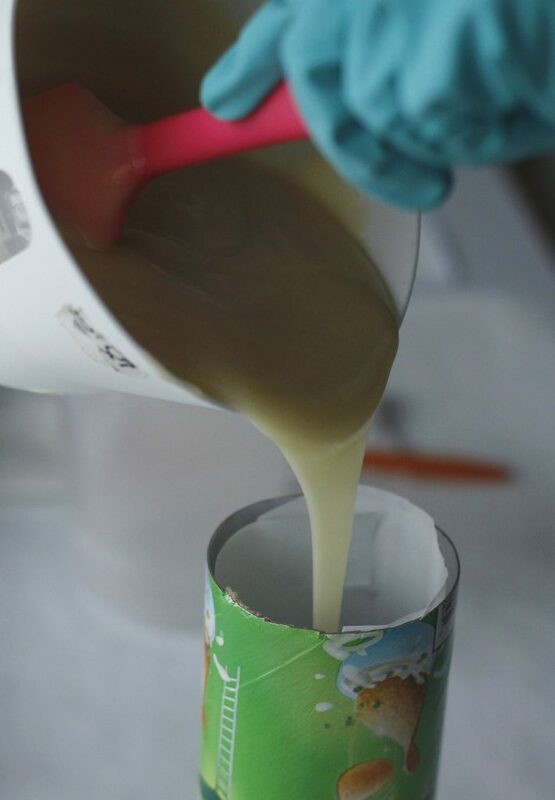 Where can I find simplistic/easy to understand instructions to learn how to make soap? check out my post on equipment needed for soap making you can buy equipment and ingredients at wholesalesuppliesplus.com or at brambleberry.com For tutorials check out soapqueen.com, look for the beginner series. 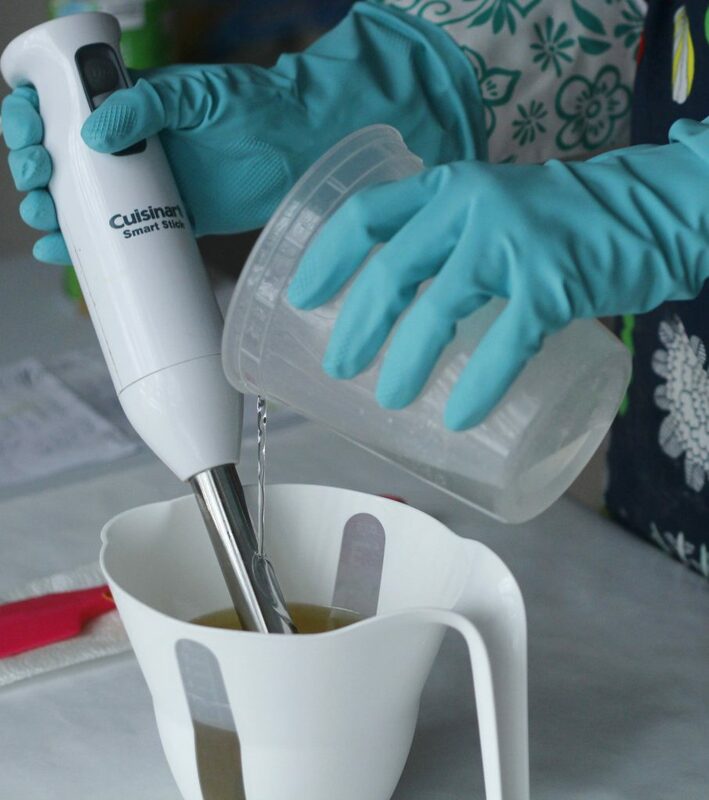 How do you clean the immersion blender? Hi Lisa, I usually keep a small container filled with water next to where I soap. When I’m done stick blending I put the blender in there a give a few pulses. Then I disconnect the shaft, so that the container doesn’t tip over. Happy Tinkering!